User-friendly, organized and creative websites with custom graphics and layouts. A simple site for $600! Including domain name registration and hosting for 2 years! No monthly fees and you can update it yourself! Power your website with only wind and solar energy. 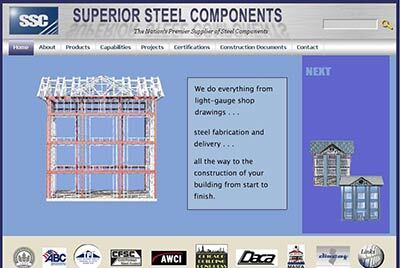 We have recently completed the website for Superior Steel Components. It includes: a flash animation on the homepage, flash interactive map, custom graphics, contact form that allows a user to choose a recipient, a form to apply for a job through the site, and flash slideshow. We offer website services to businesses, non-profit organizations and individuals. We, Lauren and Raad Amer, will work with you to develop a website that best fits your cyber needs.